Azure Functions lets you host your functions on Linux in your own custom container. You can also host on a default Azure App Service container. This functionality requires the Functions 2.x runtime. In this tutorial, you learn how to deploy your functions to Azure as a custom Docker image. This pattern is useful when you need to customize the built-in App Service container image. You may want to use a custom image when your functions need a specific language version or require a specific dependency or configuration that isn't provided within the built-in image. Supported base images for Azure Functions are found in the Azure Functions base images repo. Python support is in preview at this time. This tutorial walks you through how to use Azure Functions Core Tools to create a function in a custom Linux image. You publish this image to a function app in Azure, which was created using the Azure CLI. Create a function app and Dockerfile using Core Tools. Build a custom image using Docker. Publish a custom image to a container registry. Create a Linux App Service plan. Deploy a function app from Docker Hub. Add application settings to the function app. The following steps are supported on a Mac, Windows, or Linux computer. Install Azure Core Tools version 2.x. Install the Azure CLI. This article requires the Azure CLI version 2.0 or later. Run az --version to find the version you have. You can also use the Azure Cloud Shell. Run the following command from the command line to create a function app project in the MyFunctionProj folder of the current local directory. When you include the --docker option, a dockerfile is generated for the project. This file is used to create a custom container in which to run the project. The base image used depends on the worker runtime language chosen. dotnet: creates a .NET class library project (.csproj). python: creates a Python project. Python for Azure Functions is currently in preview. To receive important updates, subscribe to the Azure App Service announcements repository on GitHub. Use the following command to navigate to the new MyFunctionProj project folder. The following command creates an HTTP-triggered function named MyHttpTrigger. The function "MyHttpTrigger" was created successfully from the "HttpTrigger" template. By default, the template creates a function that requires a function key when making requests. To make it easier to test the function in Azure, you need to update the function to allow anonymous access. The way that you make this change depends on your functions project language. Open the MyHttpTrigger.cs code file that is your new function and update the AuthorizationLevel attribute in the function definition to a value of Anonymous and save your changes. Open the function.json file for your new function in a text editor, update the authLevel property in bindings to anonymous, and save your changes. Now you can call the function in Azure without having to supply the function key. The function key is never required when running locally. The following command starts the function app. The app runs using the same Azure Functions runtime that is in Azure. Now that you have run your function locally, you can create the function app and other required resources in Azure. The complete list of supported base images for Azure Functions can be found in the Azure Functions base image page. In the root folder, run the docker build command, and provide a name, mydockerimage, and tag, v1.0.0. Replace <docker-id> with your Docker Hub account ID. This command builds the Docker image for the container. docker build --tag <docker-id>/mydockerimage:v1.0.0 . Verify that the image you built works by running the Docker image in a local container. Issue the docker run command and pass the name and tag of the image to it. Be sure to specify the port using the -p argument. With the custom image running in a local Docker container, verify the function app and container are functioning correctly by browsing to http://localhost:8080. After you have verified the function app in the container, stop the execution. Now, you can push the custom image to your Docker Hub account. A registry is an application that hosts images and provides services image and container services. To share your image, you must push it to a registry. Docker Hub is a registry for Docker images that allows you to host your own repositories, either public or private. Before you can push an image, you must sign in to Docker Hub using the docker login command. Replace <docker-id> with your account name and type in your password into the console at the prompt. For other Docker Hub password options, see the docker login command documentation. A "login succeeded" message confirms that you are logged in. After you have signed in, you push the image to Docker Hub by using the docker push command. Verify that the push succeeded by examining the command's output. Now, you can use this image as the deployment source for a new function app in Azure. Create a resource group with the az group create. An Azure resource group is a logical container into which Azure resources like function apps, databases, and storage accounts are deployed and managed. The following example creates a resource group named myResourceGroup. If you are not using Cloud Shell, sign in first using az login. You generally create your resource group and the resources in a region near you. To see all supported locations for App Service plans, run the az appservice list-locations command. Functions uses a general-purpose account in Azure Storage to maintain state and other information about your functions. Create a general-purpose storage account in the resource group you created by using the az storage account create command. In the following command, substitute a globally unique storage account name where you see the <storage_name> placeholder. Storage account names must be between 3 and 24 characters in length and may contain numbers and lowercase letters only. // Remaining output has been truncated for readability. Linux hosting for Functions is currently not supported on consumption plans. You have to host Linux container apps in a Linux App Service plan. 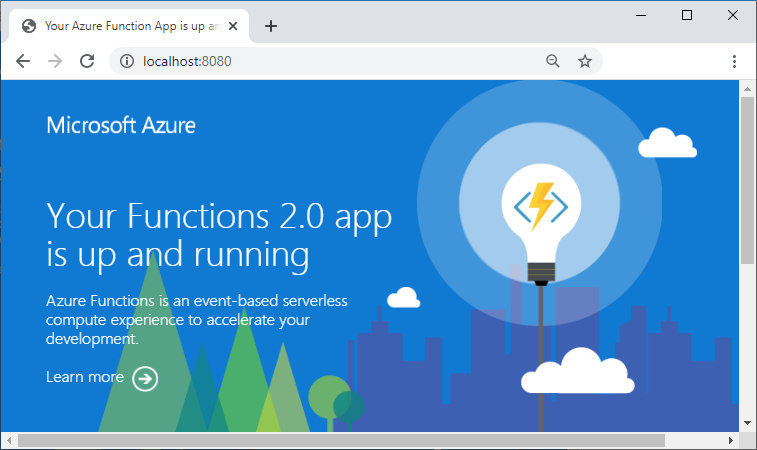 To learn more about hosting, see Azure Functions hosting plans comparison. In the Cloud Shell, create an App Service plan in the resource group with the az appservice plan create command. The following example creates an App Service plan named myAppServicePlan in the Basic pricing tier (--sku B1) and in a Linux container (--is-linux). The function app hosts the execution of your functions. Create a function app from a Docker Hub image by using the az functionapp create command. In the following command, substitute a unique function app name where you see the <app_name> placeholder and the storage account name for <storage_name>. The <app_name> is used as the default DNS domain for the function app, and so the name needs to be unique across all apps in Azure. As before, <docker-id> is your Docker account name. The deployment-container-image-name parameter indicates the image hosted on Docker Hub to use to create the function app. Use the az functionapp config container show command to view information about the image used for deployment. Use the az functionapp config container set command to deploy from a different image. The function needs the connection string to connect to the default storage account. When you are publishing your custom image to a private container account, you should instead set these application settings as environment variables in the Dockerfile using the ENV instruction, or something similar. In this case, <storage_name> is the name of the storage account you created. Get the connection string with the az storage account show-connection-string command. Add these application settings in the function app with the az functionapp config appsettings set command. You can now test your functions running on Linux in Azure. Use cURL to test the deployed function on a Mac or Linux computer or using Powershell on Windows. Execute the following cURL command, replacing the <app_name> placeholder with the name of your function app. Append the query string &name=<yourname> to the URL. If you don't have cURLor Invoke-WebRequest available in your command line, enter the same URL in the address of your web browser. Again, replace the <app_name> placeholder with the name of your function app, and append the query string &name=<yourname> to the URL and execute the request. The recommended way to monitor the execution of your functions is by integrating your function app with Azure Application Insights. When you create a function app in the Azure portal, this integration is done for you by default. However, when you create your function app by using the Azure CLI, the integration in your function app in Azure isn't done. Functions makes it simple to add Application Insights integration to a function app from the Azure portal. Name Unique app name It's easiest to use the same name as your function app, which must be unique in your subscription. Location West Europe If possible, use the same region as your function app, or near to it. Choose OK. The Application Insights resource is created in the same resource group and subscription as your function app. After creation completes, close the Application Insights window. Back in your function app, select Application settings, and scroll down to Application settings. 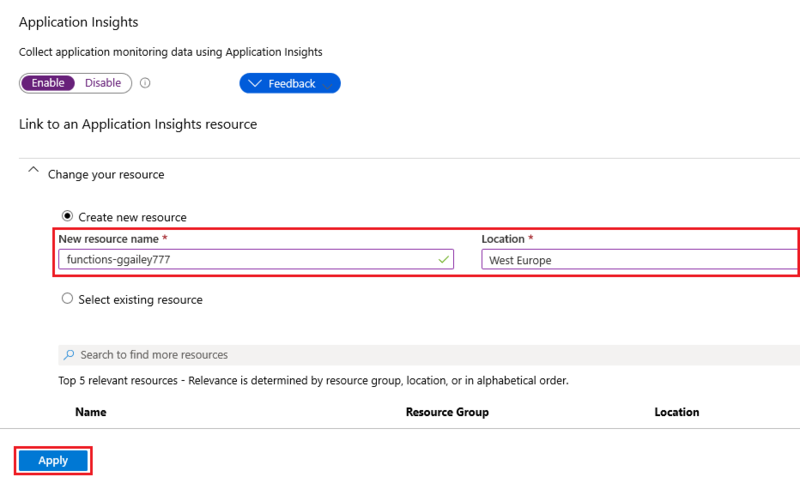 When you see a setting named APPINSIGHTS_INSTRUMENTATIONKEY, it means that Application Insights integration is enabled for your function app running in Azure. To learn more, see Monitor Azure Functions. One of the benefits of using containers is being able to automatically deploy updates when containers are updated in the registry. Enable continuous deployment with the az functionapp deployment container config command. This command returns the deployment webhook URL after continuous deployment is enabled. You can also use the az functionapp deployment container show-cd-url command to return this URL. Copy the deployment URL and browse to your DockerHub repo, choose the Webhooks tab, type a Webhook name for the webhook, paste your URL in Webhook URL, and then choose the plus sign (+). With the webhook set, any updates to the linked image in DockerHub result in the function app downloading and installing the latest image. Learn how to enable continuous integration functionality built into the core App Service platform. You can configure your function app so that the container is redeployed when you update your image in Docker Hub.